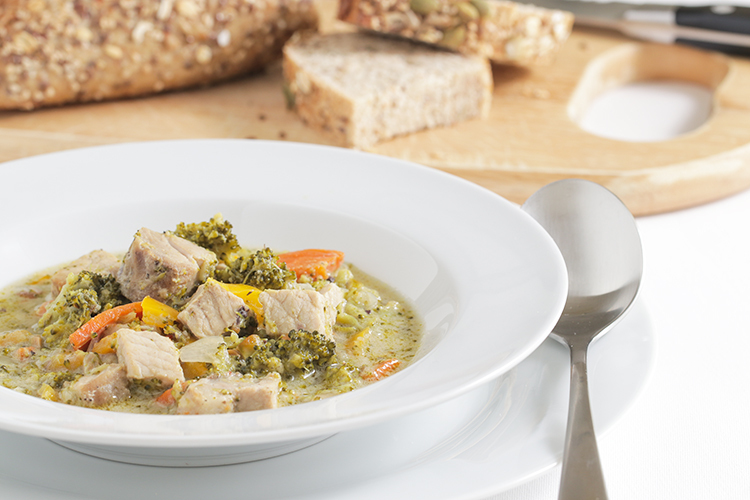 The second best dish to a delicious pork loin roast is a leftover pork loin roast recycled in a thick broccoli soup! Key to this splendid meal is a juicy-cooked pork loin roast to begin with, then fresh vegetables sauteed and left to swim in canned broccoli soup with two cups of water. Serve hot with a fresh baked harvest bread. My recycled pork loin roast started with this pistachio-crusted pork loin roast. It was a near six-pound roast on sale that had been cut in half, and I thought what a wonderful alternative it would be cook at a holiday meal. The plan was to cook half right away, freeze the second half for later. I chopped the pistachios with a knife, as you can see. But frankly, this wasn’t my favorite way to crust the pork loin roast. Crushing the pistachio and rolling the pork roast on all sides offers a lot more flavor and a more exciting presentation. Moreover, the pistachio sticks better to the roast. 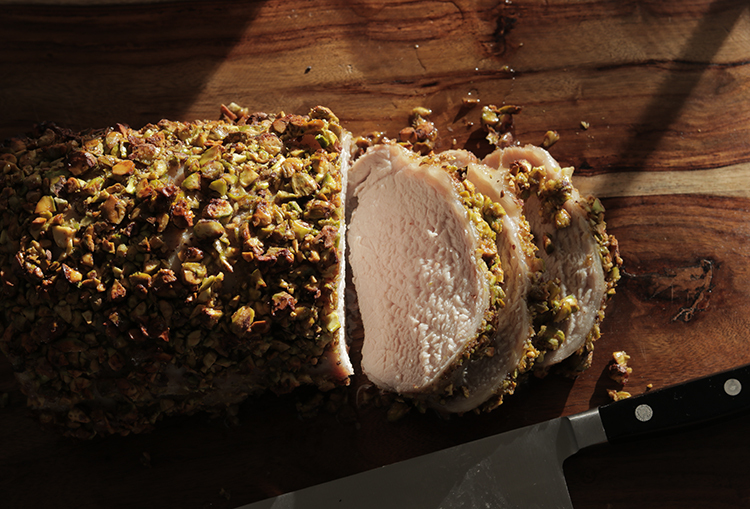 Get the recipe for the second half: Pistachio-Crusted Pork Loin Roast. And so I do what I often do, develop a soup recipe with a leftover roast, a leftover almost anything. And yes, I included the pistachios. 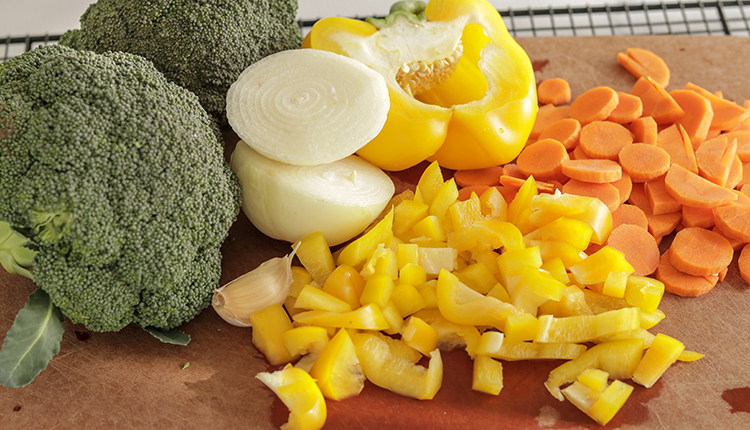 I started with flavors and colors of vegetables: the sweet tastes of a yellow bell pepper and orange carrot. Onions and garlic are always great flavor staples. I added broccoli particularly for its texture, and frankly it’s just a down right healthy choice. Roasting the vegetables would have intensified the flavors but I had elected to sautee the vegetables in olive oil and butter. Then I continued to cook the vegetables in canned broccoli soup. The last ingredient I added was the cubed leftover pork loin roast, including the pistashio. Over medium heat, melt the butter in the olive oil. Add carrots and cook for about 5-7 minutes or until carrots are near tender. Push carrots to the side of the pot and add bell peppers. Place the cover on the pot and cook for about another 5 minutes. Push bell peppers aside and add onions. Sautee onions until near translucent. Add garlic. Push onions aside in the pan. Add broccoli floret and sliced stem pieces and sautee for about 3 minutes. Mix all vegetables together. Stir in Cream of Broccoli soup and water. Add pork loin roast cubes, cover and simmer for 5-10 minutes.